Amber Lipsey/Courier Associated Students held the "Hippy Hop" Eco-Fair by the mirror pools on Thursday, May 24, 2018. The eco-fair presented ways for students to participate in sustainable methods of eating, and living to reduce their carbon footprint. 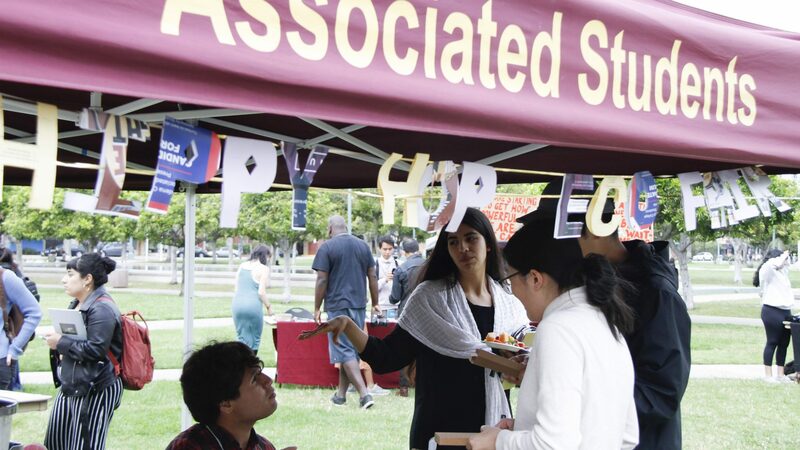 PCC’s Associated Students (AS) hosted their first eco fair, Hippy Hop, at the mirror pools this past Thursday, consisting of educational workshops and informative booths by a vegan outreach group, an international humanitarian organization and members of the AS sustainability committee. The purpose behind the event was to educate people about the severity in which the planet is being destroyed. Event coordinator Samantha Salomon explained this further in her presentation about plastic and pollution. Salomon discussed the rapidly growing “trash islands” which are phenomenons in the oceans where gyres are created. Gyres are where currents meet and everything in those currents is collected, creating these trash islands. The nearest trash island is the Great Pacific Garbage Patch, located between the California coast and Hawaii. Some say it is the size of Texas or larger, however, the size is hard to identify because of its alarming growth. Most of these patches are made up of 90 percent plastic and mostly from manufacturers that pollute into the oceans. Cities in the Philippines are currently protesting single-use plastic items due to the overwhelming amount of pollution washing up on their islands. Additionally, manufacturers are releasing pellets into the oceans called “nurdles” which are a byproduct of plastic. Nurdles are extremely difficult to clean up due to their size and can cause a lot of damage to animals and their ecosystems and habitats. “I strongly believe that change starts with the individual,” said Salomon. The message that change is more than just recycling was strongly expressed throughout the event. 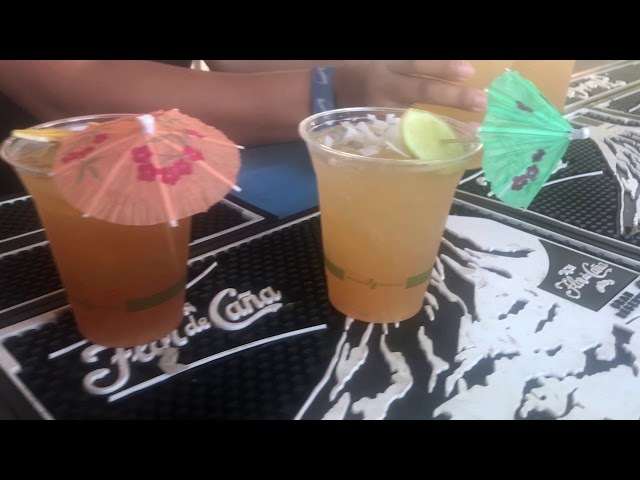 Small individual changes are important, such as ditching plastic straws, using reusable water bottles and utensils and buying more eco-friendly, sustainable products. Salomon explained that the production of a straw is especially harmful. The production process of a straw releases greenhouse gases into the air and toxic chemicals into the oceans and soil, all to be thrown away after 30 to 60 minutes of use. The straw will take an average of 90 years to “decompose,” but even then, it only breaks down into smaller particles of plastic that are still toxic. Diego Sevilla, an environmental science major, discussed how corporations manipulate facts in order to sustain their toxic complicity. Sevilla believes it is important to be vigilant about our planet’s well-being and critical about the things we consume and buy. He mentioned the sugar industry paying off scientists to lie about the effects of sugar in the 1960s. “Knowing that we are lied to a lot by corporations inspired me to do my own research and get to the bottom of things,” said Sevilla. The non-profit organization Tzu Chi had their own booth educating attendees on their mission. Tzu Chi is an international Buddhist organization that provides humanitarian relief after natural disasters. What makes them unique from other organizations is their use of repurposing plastic to help those in need. They take plastic, reduce it back into pellets, turn the pellets into fine threads and then those threads are woven into blankets for disaster relief victims. PCC student Jack Chang taks with a volunteer during the “Hippy Hop” Eco-Fair at the mirror pools on Thursday, May 24, 2018. The eco-fair presented ways for students to participate in sustainable methods of eating, and living to reduce their carbon footprint. 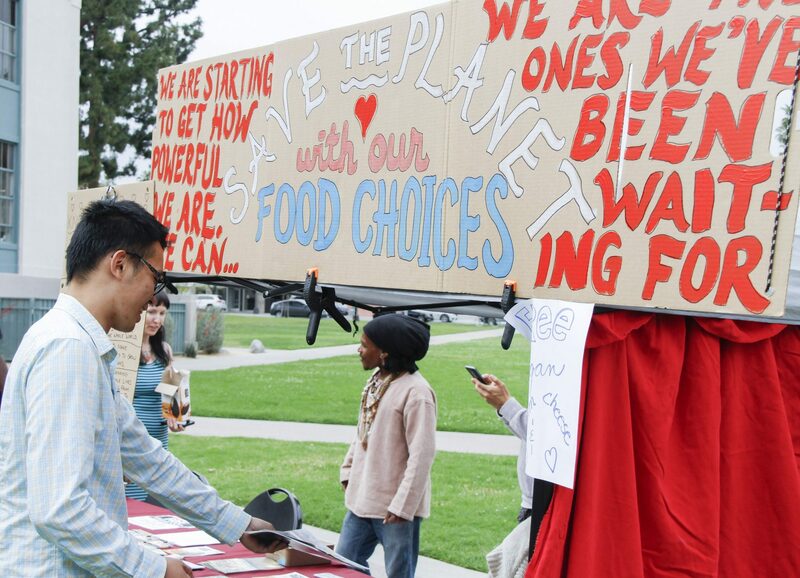 A vegan outreach group was also there to inform students about the connection between our food and the environment. Shannon Marghy, a vegan activist, explained how detrimental the animal agricultural industry is to our environment. 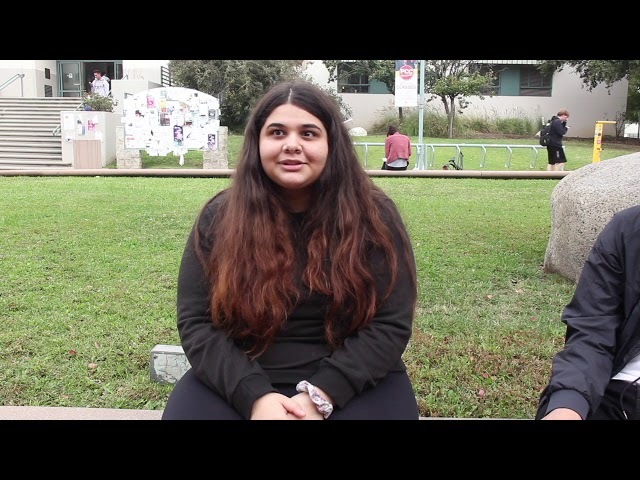 She stated that animal agriculture is heavily contributing to Earth’s pollution and global warming. The United Nations believes that animal agriculture produces far more greenhouse gases than cars, trains or buses. Marghy believes that these conversations are not happening because the government does not care about society, only corporations and money. Marghy also believes that change is individual and that doing something radical like driving less is probably not practical for some people, so substituting animal products with healthy and ethical alternatives might be easier for people. AS had a couple booths with demonstrations and a workshop. One booth was dedicated to showing people how to turn old T-shirts into reusable tote bags. 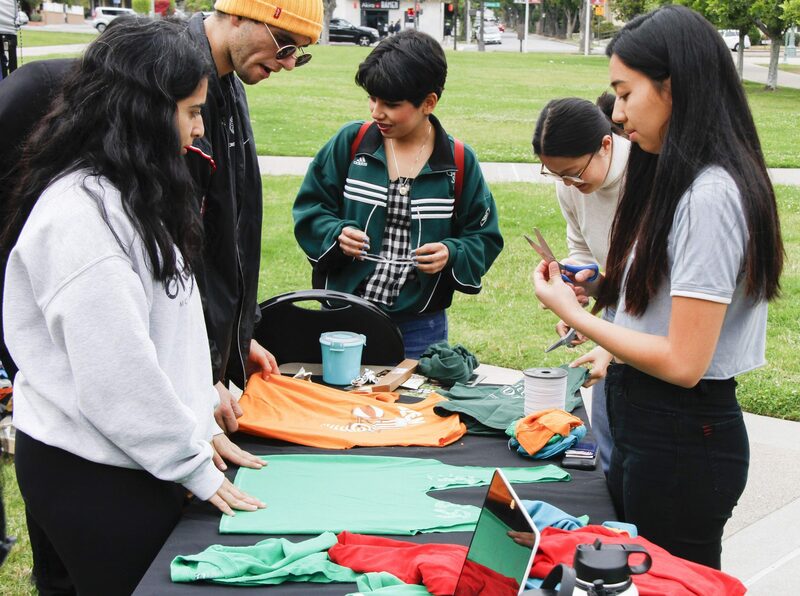 While people were able to learn how to repurpose old clothes, a member of the sustainability committee educated people about the importance of buying used clothes. Associated Students members make custom t-shirts during the “Hippy Hop” Eco-Fair at the mirror pools on Thursday, May 24, 2018. The eco-fair presented ways for students to participate in sustainable methods of eating, and living to reduce their carbon footprint. Fast fashion has become a popular trend in American fashion culture. Companies such as Forever 21 and H&M are considered fast fashion companies in which garments are made for a relatively low cost. These companies usually use child labor and unethical environmental practices which is why they are able to sell their clothes for a low cost. Members of the sustainability committee also participated in a zero-waste activity that required them to reserve all their non-biodegradable waste into a mason jar for one week. 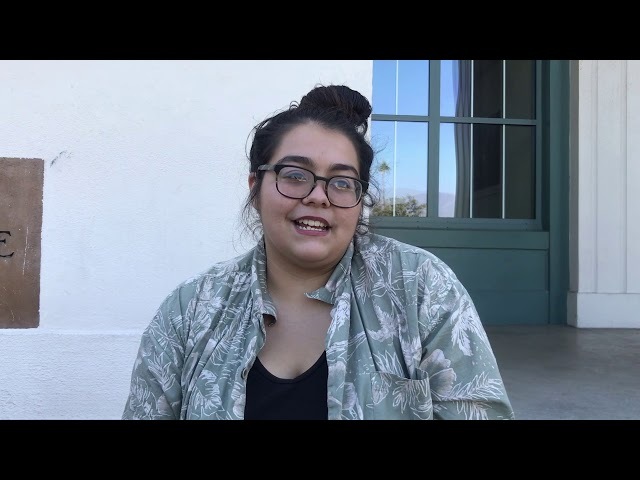 Iliana Talamantes, sustainability committee member, shared her experience and different actions she took to make a change. Things like shorter showers and brushing your teeth in the shower can greatly reduce water waste. 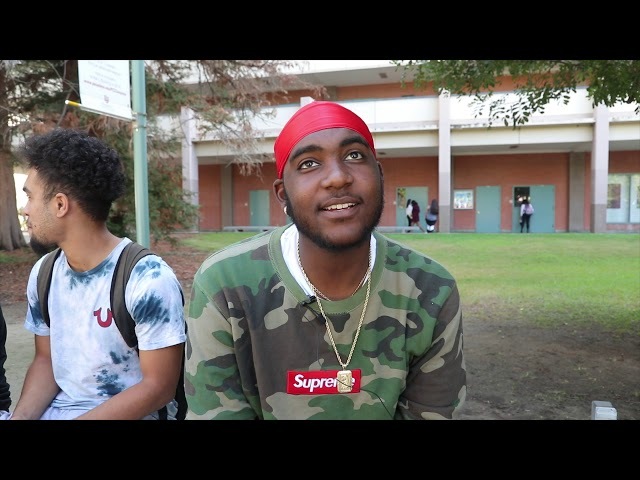 The organizers of Hippy Hop wanted people to leave with information they could carry on with them in life and reward them with an eco-friendly product. Event goers were given a paper to fill out with five ways they could make individual change. When properly filled out, people were given the option of either a bamboo toothbrush or a pack of glass straws. Organizers hoped that this will encourage people to try and make the world an easier place to live. “We need to learn to live with the people around us in the best way we can,” said Sevilla. ‘Voicenotes’: Who tf broke Charlie Puth’s heart?